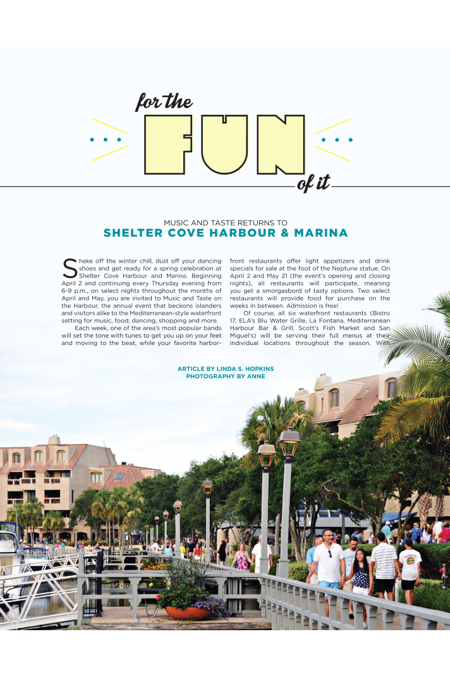 Shake off the winter chill, dust off your dancing shoes and get ready for a spring celebration at Shelter Cove Harbour and Marina. Beginning April 2 and continuing every Thursday evening from 6-9 p.m., on select nights throughout the months of April and May, you are invited to Music and Taste on the Harbour, the annual event that beckons islanders and visitors alike to the Mediterranean-style waterfront setting for music, food, dancing, shopping and more. 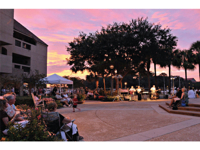 Each week, one of the area’s most popular bands will set the tone with tunes to get you up on your feet and moving to the beat, while your favorite harbor-front restaurants offer light appetizers and drink specials for sale at the foot of the Neptune statue. On April 2 and May 21 (the event’s opening and closing nights), all restaurants will participate, meaning you get a smorgasbord of tasty options. Two select restaurants will provide food for purchase on the weeks in between. Admission is free! Of course, all six waterfront restaurants (Bistro 17, ELA’s Blu Water Grille, La Fontana, Mediterranean Harbour Bar & Grill, Scott’s Fish Market and San Miguel’s) will be serving their full menus at their individual locations throughout the season. 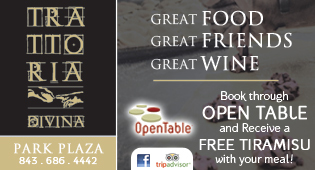 With stunning views, indoor and outdoor dining and a variety of cuisines, you’ll want to return and experience them all. 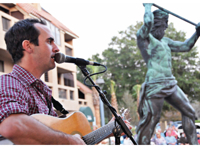 Andy Pitts of Lowcountry Boil Band performs in front of the King Neptune statue. Target the Band performs for a crowd of people at last year’s Music and Taste on the Harbour. While you’re eating, drinking, dancing and enjoying a glorious sunset, take a stroll down the harbor to acquaint or reacquaint yourself with the variety of shops, services and amenities available for your leisure and entertainment. If you’re in the mood for some retail therapy, you’ll find it in every nook and cranny along the way. From European fashions to American arts and crafts, fine art, vacation clothing, souvenirs, gifts and toys—even yacht sales and real estate opportunities—there’s something to entice every shopper. When you’re ready to drop a line and spin some new fish tales, inshore, near shore and offshore fishing is available through an impressive fleet of seven private charter boats at Shelter Cove Marina. New additions this year include the Maverick, an 18-ft. flat skiff boat, the Phantom, a 26-ft. Pathfinder with a 3000 hp. Yamaha motor, and the 31-ft. Fat Baby. In addition to fishing, boating options include sport crabbing, sightseeing and nature excursions, sail and powerboat rentals, guided cruises and large party boats. 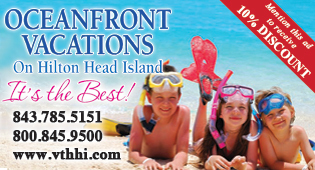 The active and adventurous water lovers among you will want to rent pontoon boats, kayaks and stand up paddle boards. Thrill seekers will jump at the chance to try jet packing, hoverboarding and parasailing. Stop off at the newly renovated Ship’s Store at Shelter Cove Marina and gear up for your activities. In addition to boat supplies, charts and fishing tackle, the recently expanded store offers a selection of coastal apparel and accessories. The Ship’s Store is the perfect place to find “Hilton Head Island” and “Shelter Cove Marina” T-shirts and other branded gear. The marina store also offers a range of convenience items, such as soft drinks, beer, wine, a coffee bar and snacks. 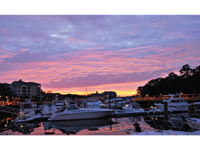 Shelter Cove Harbour & Marina is located at mile marker 8 on William Hilton Parkway, across from Palmetto Dunes. For more information, visit palmettodunes.com/shelter-cove-harbour.php. All events are weather permitting and subject to change. Limited seating available. Bring canned goods for donation to the Deep Well Project. No coolers, please. On April 11, Nash Gallery will host its 7th annual local crafts fair from 10 a.m.-4 p.m. According to gallery owner Lynn Alexander, anywhere from 14-20 local artists—all from Hilton Head Island and Bluffton—will be on hand to show and sell their wares. 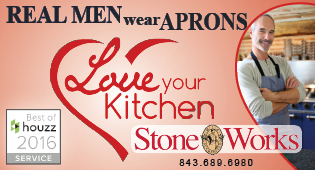 A variety of mediums will be represented including pottery, jewelry, wood, clay and photography. The art will be displayed near the Neptune statue at Shelter Cove Harbour, rain or shine. Admission is free. 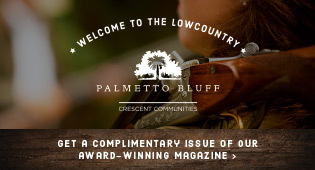 For more information, call Nash Gallery at (843) 785-6424.